San Diego-based Robo3D is another Kickstarter backed 3D printer, achieving more than eight times its $49,000 Kickstarter goal with about a week to go. 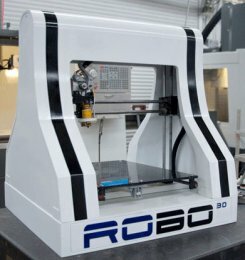 Price is expected to be Robo3D's unique selling point, and retailing at around $520 for an assembled printer, it should be one of the cheapest 3D printers on the market. The open-source RoBo 3D has a build volume of 10 x 10 x 8 inches and prints in PLA. An ABS version is available For $99 extra.